Some time ago, standard IAS 1 Presentation of Financial Statements significantly changed and introduced the statement of other comprehensive income. And then it began: lots of confusion, frustration and doubts! Many of us simply did not get the point and started to flounder in the fog. What items belong to OCI? What items belong to P/L? This situation persists until now. Even in these days when I work with the client I see that she is not sure whether she is dealing with other comprehensive income or profit or loss. And, how do the changes in equity fit in? What is the difference between other comprehensive income and profit or loss? What is the difference between other comprehensive income and changes in equity? Let’s bring it some light. Surprised? It is as simple as that: the whole thing becomes clear when you focus on the net assets. First, we need to understand what the net assets are. Net assets are simply total assets less total liabilities of a company. It is the same as equity which is the residual interest in the assets of an entity after deducting all of its liabilities. As you can see above, if total assets are greater than total liabilities, then there is a positive equity or net assets. In the opaque situation when total assets are lower than total liabilities, there is a negative equity or net assets. What items belong to net assets? Well, basically it is share capital, share premium, reserves, retained earnings or losses and some other items, too. 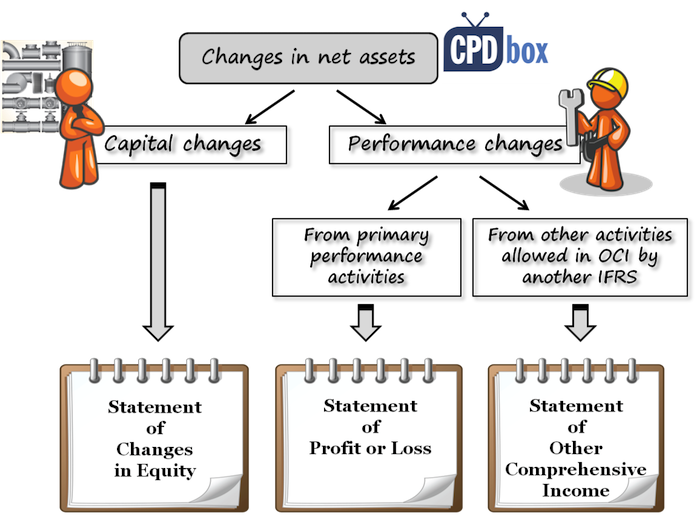 What can cause the change in net assets? The key to understand the difference between profit or loss, other comprehensive income and changes in equity is to understand where these changes are coming from. So which statement to use? All capital changes must be reported in the statement of changes in equity. Performance changes – these are all changes coming from the activities of the company and not from the shareholders. All other income and expenses, such as finance, administrative, marketing, personnel, etc. The main point here is that other IFRS standard does not permit recognition of these changes directly to equity. All these changes are reported in profit or loss. ii. Changes resulting from other, non-primary or non-revenue producing activities of the company that are not reported in profit or loss as required or permitted by other IFRS standard. For financial liabilities designated as at fair value through profit or loss: fair value changes attributable to changes in the liability’s credit risk (IFRS 9). This list is quite exhaustive and I really cannot think of other items that should potentially belong here. All these changes are reported in other comprehensive income. Step 1: Performance or capital change? Is it performance change or capital change? The reason for introducing other comprehensive income and merging it with profit or loss into the statement of comprehensive income was to distinguish between capital and performance changes. The company needs to show clearly why its net assets go up or down – is it due to capital change? Or is it due to performance change? Step 2: Allowed by other IFRS to OCI? And then, if it is a performance change, is it from primary activity? Can we report it directly to equity in other comprehensive income – is it allowed by some IFRS standard or not? If you answer these questions I’m sure you’ll never fall into trap of the wrong reporting and messing up individual components of your IFRS financial statements. Thanks Silvia. This certainly clears up a few grey areas for me. Thank you for the explanations. The graphic really drive it home. Thank you SILIVIA for teaching ifrs in a simple manner, easy to understand keep on.TKS! Just want to say thank you for taking out time to write such helpful articles. Please is there any way to download this article ? Thanks a lot. Now I can see that these things can be understandable. Be blessed a lot for your Good work. Sylvia, you are great. Your tutorials have help me a lot. Thanks!!! Hi Jibola, I’m happy you like my page 🙂 Please contact me through the contact page. Thank you! S.
Guess one of the best explanations of how to treat items in three broad heads. Silvia – Do you have something that explains hedge accounting. I dont understand that why the effective portion in a fair value hedge is not taken in OCI. And interestingly I have not seen it separately even in Profit and Loss. Well, if you have a fair value hedge, then you don’t even need to calculate “effective” and “ineffective” part – that’s irrelevant. But on the other hand, you should also adjust the carrying amount of the hedged item to profit or loss – so in fact, you book 2 entries (1 on hedged item and the other one on hedging instrument and there will be an offset). You don’t do this in a cash flow hedge. S.
I would like to know the accounting standard with practical examples. I see the heading “Gain (loss) on strategic equity securities” at non recycled subsequently items. Would you give me explanation and example related this item ? Thank you Sivia. Your explanation is really helpful. Per IAS 1 Amendment 2013, presentation OCI is divided between those items that might be recycled to profit and loss subsequently and those items that will not. I am confusing what is the logic between those separation and is there a clue when a specific OCI will be recycle or not? there is a logic, because by showing these items separately, you are warning the users of financial statements about the potential future impact on profit or loss related to certain items. Items not recycled will not have an impact, but items recycled will have an impact on future P/L and potentially dividends, that’s the point. Clue: Well, the clues are all over the standards. There isn’t comprehensive list of these items, but when some specific standard prescribes some accounting treatment, it usually tells you whether this item will or will not be recycled. Supperb! thanks for this clearity. This as been a problem for me. I would like to know whether the changes in fair value of assets held for sale under IFRS 5 are taken in P&L or OCI? It would go to profit or loss because such change is not required for recognition in OCI by “any specific IFRS”. Like Sylvia accurately explained; for an item to be taken to OCI it must be required by a specific IFRS (it’s kinda rule based). Should you report loan forgiven/written off by a lender in the OCI or P or L? Ronke, it’s P/L and I can’t think of any case when it is OCI. S.
Silvia.. I must say that nobody other than yourself could explain this any better..
for opening the new sides of thinking on this point. Could you please let me know for what all purposes (like dividend payment, bonus shares etc) the balance lying in Other Comprehensive (OCI) can be used ? Does the standard say anything on this? The Company has a funded defined benefit plan that is being administered by a trustee covering all eligible employees who have been with the Company for at least five years. The plan was terminated in March, 2016 following the Company’s Plan of Complete Dissolution and Liquidation.The employees covered by this plan will be transferred to another company and also its retirement plan. 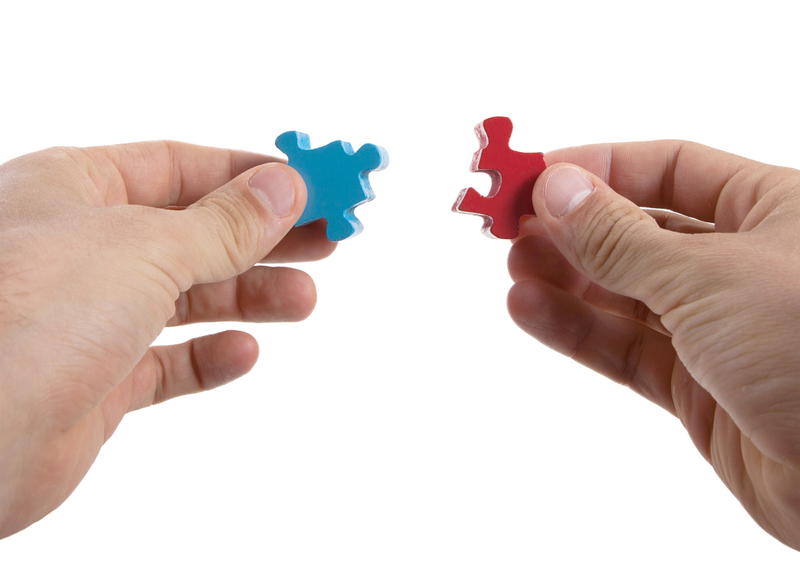 Both companies maintained their plan with the same trustee. The accumulated OCI resulted from accumulated actuarial gains and losses. What will be my entries to close all of the accounts since the Company will be terminating the plan and transferring the plan to another company? Can I close the difference to Retained Earnings or to Accumulated OCI. Please Sivia is it to avoid causing profit to fluctuate that some gain have been hidden in oci? no, I would not say so. The main reason for presenting some items in OCI is to separate the items generated by the company’s operations from the items generated by other factors, like movements in fair value. S.
I have been looking for a conceptual understanding of OCI and your model appeared to do that, but please explain how gain/loss on sale of PPE is considered a primary or revenue producing activity of the entity in order for it to be chucked into P&L? Or the impairment of PPE? Or the write off or foreign currency changes of a related party loan? I feel i’m missing something? Silvia, God Richly Bless You All. Am very glad with the explanation u’hv given. There exists a parent and a subsidiary , and the parent for the sake of proper management of land , has decided to take over the land of subsidiaries. The accounting treatment being proposed is Credit Land and Debit Reserves in the books of subsidiary ( if there is sufficient reserves). So my question is whether the transaction being proposed is correct and which standard is to be referred for above scenario. under IFRS, you rarely credit these transactions directly to equity. If the ownership of the land was truly transferred to the parent, then under IAS 16, you should derecognize the land and recognize profit or loss on disposal. S.
Since IAS 39 will no longer be in effect after being superseded by IFRS 9 come 2018. Will the change mentioned in Note A be removed as part of OCI? thanks. in fat, the description would be updated to reflect the change. Although there are no available-for-sale assets under IFRS 9, you can still present some gains and losses on remeasuring certain assets in equity (OCI). S.
Where can i present the changes in fair value of financial liability? Example changes of market value of dividends payable to perpetuity. in OCI or Profit or loss? This is not distributable to shareholders right? because it is unrealized. So OCI is a distributable reserve correct? I can utilise it to pay dividend? My co has a share redemption at discount, so auditor eliminate our preference shares with its share premium and transfer the discount on redemption to OCI. This depends on your legislation. The problem with OCI is that some items stay there, some items get recycled via profit or loss. The purpose of OCI is to show that some increases or decreases of resources are caused by the matters other than your operating activity – that’s why it is separate from profit or loss. S.
What is the logic of recognizing changes in Actuarial valuation to OCI. Is it not an activity related to the primary business. i.e providing retirement benefits to the employees? the logic is that the change in defined benefit plan liability arose NOT due to primary activity (current year service etc. ), but from other factors out of company’s control, such as change in actuarial assumptions. S.
Can we distribute OCI on stake holders like dividend. Please dear could you explain a little on how and where (P/L or OIC) to present a sale of PPE? either Loss/gain? This is great Ms Silvia. Thanks. Bravo and thanks for producing such a knowledgeable article. I already buy ur IFRS kit and it is wrothful. Hi, I am struggling to understand how any revaluation surplusses on fixed assets (tangible and intangible) are included within the ‘items that will never be reclassified to P&L” within OCI. Surely, if they asset is sold, any revaluation surplus is realised and must go to P&L.?? Wow. This is so great, touching real practical matters. I always put revaluation adjustments to OCI. I would be glad if you guide us on depreciation on revaluation model. I split depreciation calculated on historical cost and portion calculated on revaluations. Is it correct that take depreciation on cost to P/L and the other to OCI as it is as a result of capital changes. Great. Cleared my concepts. Outstanding ! Good one Sylvia. You explained it as simple as ABC. This is Financial Accounting made simple. Thank you. This is an amazing presentation which clears me some doubt in financial reporting. Amazing Silivia….I am from India…I haven’t met any Faculty who could explain IFRS in such a simplified manner..u r superb…it would have been little more beneficial if I could get these Articles in PDF form.. Thank you silvia. It is so useful presentation. You,re awesome. The concept is clearer the way you explained visual and theoretical is something different. Thanks very much dear. I owe u much…. Thank you silvia. It is a great explanation. Thank you so much for clearing our confusion relating to IFRS. The way you explain it with such an ease is simply remarkable. Your articles and videos has really helped me in conceptual clarity and office works. Dear Amit, thanks a lot for your kind words, I really appreciate! Thank you so much Siliva..
From where can i get your e material ?